For those that may not know what HTPC is it an acronym for Home Theatre Personal Computer. Basically it is a PC that is dedicated to being a media computer connected to your Home Theatre System. After a long time of researching options and components I have finally sourced out my HTPC system. 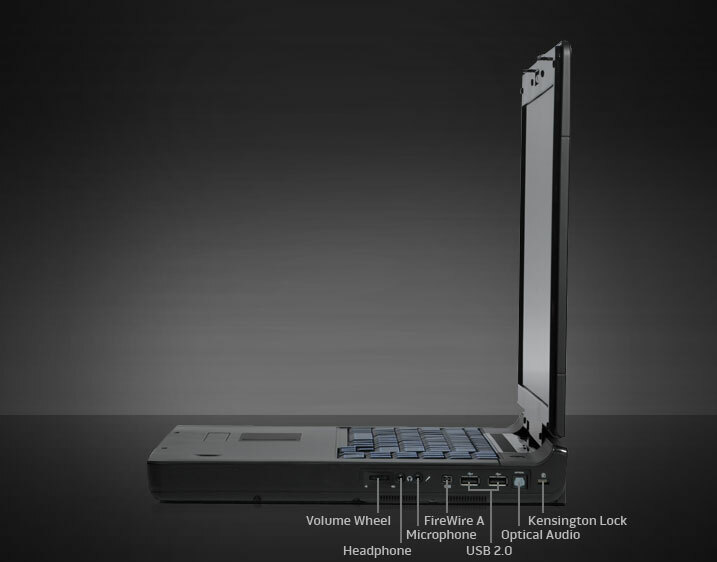 The main concerns other than performance with this system was power efficiency and noise. 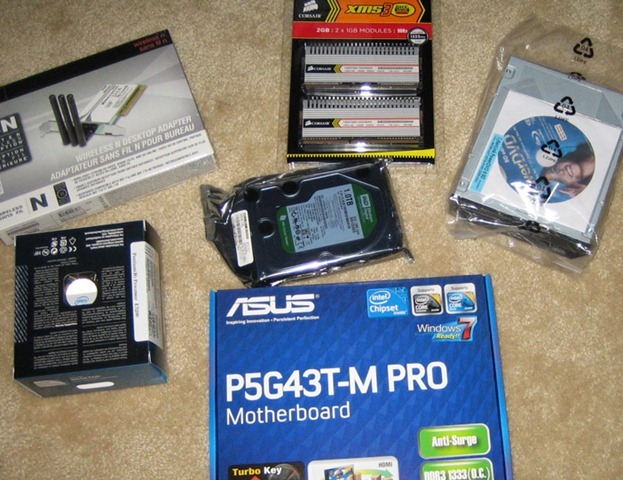 As you will notice the components include the EARTHWATTS 80PLUS power supply, Western Digitals Green 1TB low energy use HDD and the ASUS 43T-M Pro green standard motherboard. There are cheaper ways of building this system but I wanted to maintain decent quality components and be as GREEN as possible with the build. 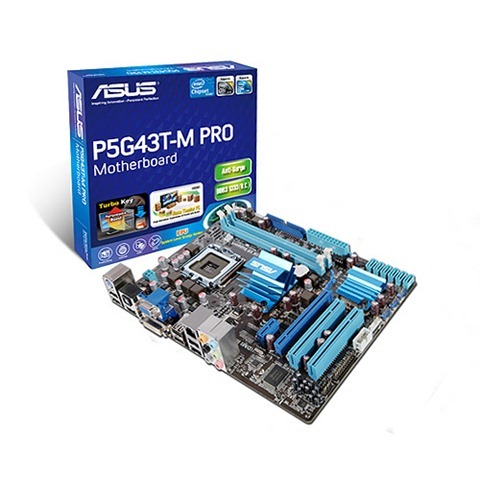 The ASUS board has integrated HDMI output on the Intel GMA X4500 graphics chip. The availability of the onboard HDMI was a huge selling point for this board as it reduces the power usage from having a PCIe card and there is no need for GPU cooling fans. 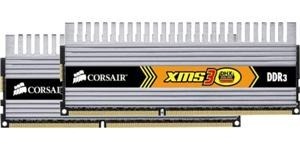 For heat reduction and stability I opted for the Corsair XMS3 with the raised heat sinks. The Antec Fusion Remote case supports Windows 7 and MCE, being available without the PSU was a big selling point as it allowed the ability to use the Earthwatts PSU. For internet connection I have opted for the D-Link Xtreme wireless N PCi card to save running cables from the room where this HTPC will reside to the data closet on the other side of the house. For ROM playback I opted for a Liteon BLU-RAY Reader to open up the versatility. CPU is a little bit of overkill for a media PC but its always worth having a little extra processing power in any computer. The system will be connected to a Sharp 37” 720P LCD for the time being until I replace that with a 40” 1080P LCD. Parts were ordered on Jan 1st 2010 from NCIX I will add to this post with the build and testing. I plan on running Windows 7 Ultimate on this system. >> Keep Checking back for the build. 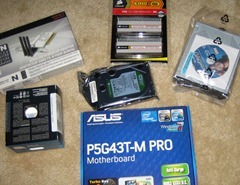 Well it is January 08 2010 and I received some parts in the mail. It looks like UPS misplaced one of the packages. The misplaced package contains the Case and PSU so just the internals have showed up. 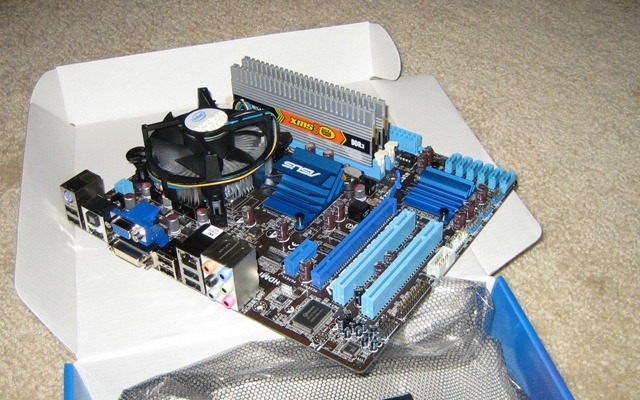 First thoughts – The MicroATX mainboard is not as tight to work with as I originally thought it would be. The CPU and Ram was easy to install and there is more than enough space to route the wires for the PSU when it arrives. The ASUS P5G43T-M Pro mATX comes with 2 X SATA cables 1 X ATA Cable, although lacking in the accessories and parts department this is a tight little attractive looking motherboard package that will make the great heart of this HTPC. Corsair Dominator ram as always looks a little over bearing on the MicroATX Motherboard but the extra cooling fins on this series of Corsair RAM I find invaluable on both OC systems and systems that passive cooling takes priority over fan cooling. HDD and SATA BLU RAY ROM Drive are OEM so there is nothing to report on these components and this time. 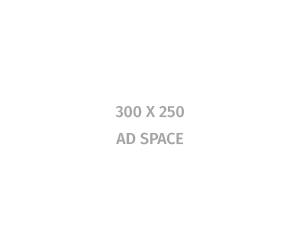 The D-LINK DWA-552 Xtreme N Desktop Adapter is compact and looks like it will have no problems fitting on the board and in the case with no interference. 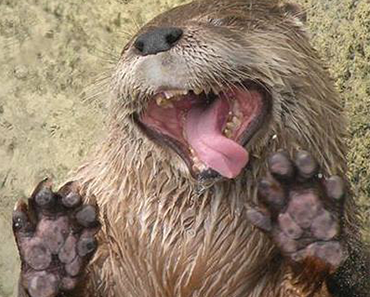 That is all to report until the rest of the package arrives. Keep coming back to see the rest of the build and the follow up performance part.